The outward appearance of the building is very important for today. Fiber cement products are chosen for it because of its reliability first of all. The ordinary boards consist of cement (90%), providing strength and resilience. That is more than enough for all types of buildings! Facade panels - CEMBOARD HD with high-density (1650 kg/m3), used for ventilated facades. The boards are coated with acrylic or polyurethane paint of any color in the catalog RAL, NCS, Monicolour etc. Each type of coating has its own brand: CYNOP, CEMCOLOUR, STRUCTURA, СYNOP NATURA, CEMSTONE. Waterproof panels - Aqua with average density (1500 kg/m3), used for interior rooms with high humidity, such as kitchens, swimming pools, bathrooms, showers, industrial shops, car washes, etc. Fire-resistant panels - Flamma with low density (1100 kg/m3), used for interior decoration of buildings and structures with high requirements for fire safety. Windproof panels - Ventus with average density (1500 kg/m3), used for decoration of high-rise buildings, balconies in mountain/coastal areas, etc., where strong wind is possible to be. The boards are impervious. - The highest quality of products; up-to-date technology; care of high reputation value. - Attractive price & variety of products: we produce eight different structure&coating boards. - Improved strength characteristics; resistance to UV and aggressive environmental substances; coating hardness. - Quick mounting installation properties: light weight, large area. 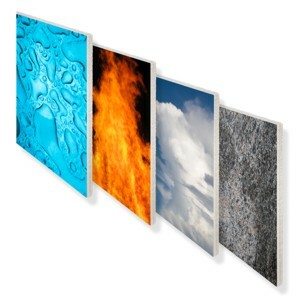 - Incombustibility; hardiness and resistance to climate exposures; environmentally safe products.